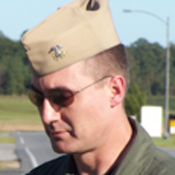 25-year military officer, Annapolis, Naval aviator, EA-6B Prowler pilot. Electronic warfare expert. Operational test director and pilot for weapons and avionics. Squadron and air base commander. 7 times deployed to Middle East and Southwest Asia. 22 months on the ground in Iraq. 3 years as Pentagon strategic planner on Joint Staff. 3 years as faculty instructor of strategy and warfighting at the Air War College. Degrees in physics, strategy, and history. Published papers on energy security and biofuels.